Ivory Tower(s) is a theoretical project that proposes a building designed with the principles derived from Boulleé’s work. ­The resulting building is both critical of and replaces the Mansueto Library located on the campus of the University of Chicago. 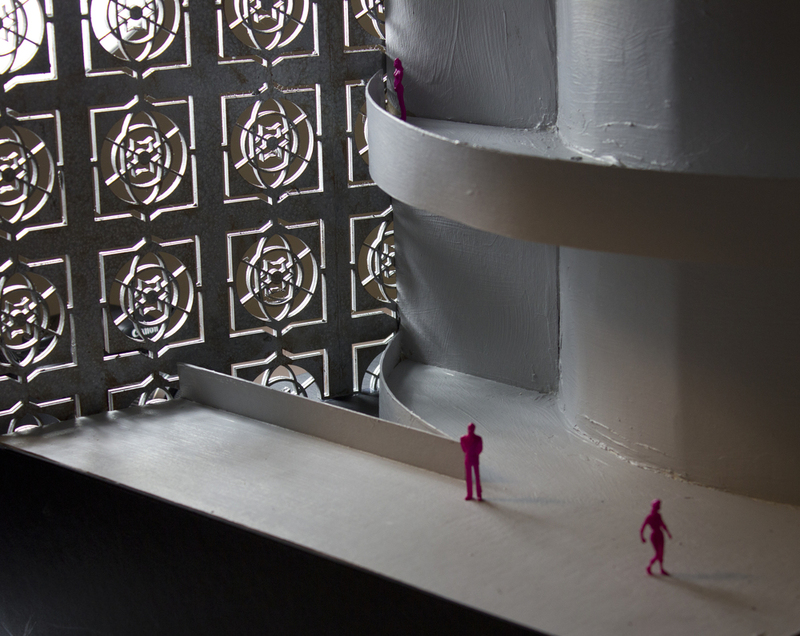 The project is driven by a fictional narrative in which the librarians of the university rebel and replace the Mansueto Library’s efficient, automated systems with a building designed as a monument to the act of knowledge seeking. The construction of the Mansueto Library at the University of Chicago introduced a novel patron-to-stack relationship, which redefined the role of the librarian. Interaction between librarians, their precious books underground, and the fortunate patrons above ground was limited. The librarians found the situation unfavorable, and responded with “informal complaints”. They eventually reclaimed the site, removing the Mansueto library in the process. The librarians began to remake the library as they saw fit, with a group of towers dedicated to each subject of knowledge, as each field, they declared, was “worthy of its own castle”. Each librarian placed the text which they considered the peak of knowledge at the apex of the towers that they administered. Over time, it became evident that each tower could not stand on its own, both intellectually and physically. The towers intertwined, forming branching paths on which patrons could explore knowledge. However, the mish-mashed towers stuck out like a sore thumb, and became the tallest building on the south side. To disguise itself amongst the skyline, the library was wrapped in a Sullivan-esque pattern that screamed “Chicago” and made it hard to read the scale of the building, allowing it to blend in in skyline panoramas. Climbing to the top of these “Ivory Towers” became the goal of many academics. The new university library became a site of pilgrimage for book lovers, hoping to be able to read the rarest and most esoteric of texts. Ivory Towers(s) is designed as a Boulleé style monument both formally and programmatically. Though it has more formal definition than the various precedents, it is composed of combined forms, specifically theme-specific towers. Though the project is a library, it can be read as a monument to knowledge or the act of knowledge seeking. When viewed in section, the project can be read as a tree diagram of the development of knowledge. The ground floor of the building is dedicated to general knowledge, getting more specific as one progresses vertically through the building. 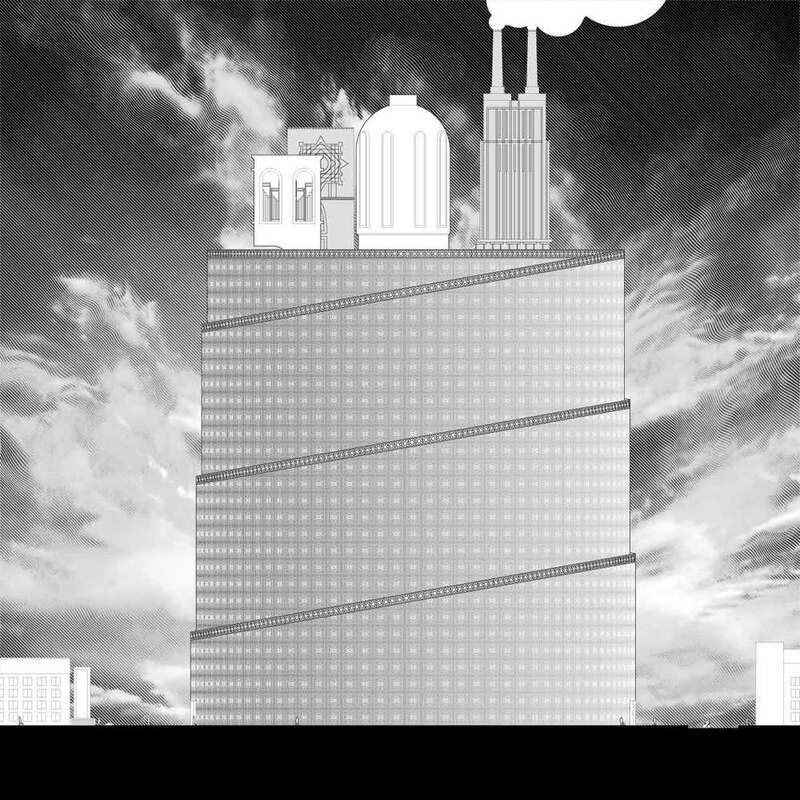 Similar to Boulleé’s formal resistance to the flux and movement of the modern metropolis, Ivory Tower(s) becomes a symbol of resistance against the engineered efficiency of everyday life. As opposed to modern library typology, which is based on the efficient organization of books, this project reorganizes the library around the growth of personal knowledge.